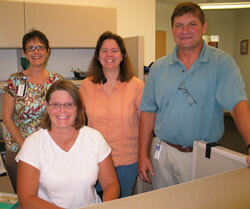 Steve Dixon, D.V.M, right, with UNMC's other two veterinarians, Noel Johnson, D.V.M., and Tami Wells, D.V.M. Wattana Barrett, lead technician for UNMC Comparative Medicine, stands next to a Hydropac machine, a state-of-the-art system used to provide high quality drinking water in FDA medical grade plastic film pouches for mice and rats. 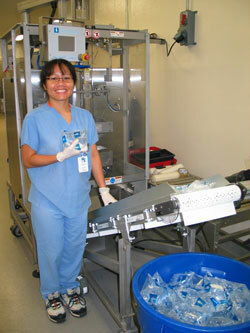 The Hydropac manufactures and fills more than 1,800 water pouches each hour for use in cages. UNMC was the second facility in the country to help pilot test the state-of-the-art system and the fourth in the world to acquire the system. Chrystal Nathan-Hirsch, veterinary technician, right, and Joe Dolezal, lead husbandry technician, demonstrate the use of flexible film isolators used to house mice and rats. The facility they work in is used to isolate and house animals that may naturally harbor disease agents that could affect other research animals at UNMC. Animals that arrive from other universities, and those on campus that may naturally carry bacteria or viruses are quarantined and cared for there until it's determined they are disease-free. Some of the comparative medicine program staff members are, standing from left Lola Martin, financial manager, Theresa Richard, facilities manager and Joe Krajicek, assistant director for operations. Sitting is Tricia Rump, business manager. Small wonder Steve Dixon, D.V.M., director of UNMC Comparative Medicine, and his 29-member team work around the clock all year long. What else would one expect from a team that cares for 19,000 "patients"? Dr. Dixon and his team oversee husbandry care and veterinary medical support for the thousands of mice, rats and other animals that support UNMC's biomedical research program. It's a 365 day-of-the-year, 24-hour operation that occupies 90,000 square feet in seven locations across campus. The hub of the operation is housed in state-of-the-art facilities in the Durham Research Center. The work is important in UNMC's pursuit of medical discoveries to alleviate human suffering. "That's the most rewarding part of it," Dr. Dixon said. "Results of using animals in research makes both people's and animals' lives better." The comparative medicine team doesn't conduct research, but supports basic and clinical research studies being conducted by UNMC scientists. Since 1992, Dr. Dixon has directed the accredited program at UNMC for the care and use of laboratory animals. The work involves maintenance, procurement and quality assurance testing of research animals; surgical, radiological and diagnostic services; consultative services for animal welfare and humane use; research protocol review, veterinary public health; and recommendation of appropriate animal models and project design. "I love working at UNMC because it's such a progressive research institution," Dr. Dixon said. "It's an exciting thing to think about the contribution animals are making in our society today." Among the primary jobs for the comparative medicine team are keeping animals clean, well-fed and free from diseases. If an animal gets sick, it may skew research results. Staff work constantly to keep the environment squeaky clean -- meaning the animals live in environments more sanitary than the best four-star hotels. When new animals from other institutions arrive on campus, they're isolated briefly to ensure they have no diseases that will expose other animals or staff members, Dr. Dixon said. Autoclaving units ensure animal cages are free of pathogens. Everything that goes into the cage is sterilized. Bedding is carefully dispensed into mice cages. Even the size of the cages is regulated. Keeping animals fed requires about 6,000 pounds of special animal feed every two weeks, he said. One of the state-of-the-art systems that keeps animals hydrated is a triple-filtered water purification system for rodent cages. UNMC was the fourth comparative medicine facility in the world to help pilot test the Hydropac system, which provides a two-week supply of water in a pouch, at about one-third of the cost of former systems. Of the 29 comparative medicine staff members, 18 don scrubs the moment they get to work to support the daily feeding and care of animals. Just as the hospital has attending physicians, Dr. Dixon is the attending veterinarian on campus. Two other veterinarians are part of the UNMC veterinarian medical team. Anywhere from 100 to 110 researchers and their staff use one of seven facilities each day, requiring the laundering of nearly 600 lab coats each week. Currently nearly 400 approved UNMC animal research protocols support either basic or clinical research. Behind the daily work that goes on here, UNMC's influence and reputation in comparative medicine spans worldwide. Board-certified in the specialty of laboratory animal medicine, Dr. Dixon has served on numerous national and international committees and is a long-term member of the 42-member Council on Accreditation of the Association for Assessment and Accreditation of Laboratory Animal Care (AAALAC International). He also has served for 15 years on the Institutional Animal Care and Use Committee (IACUC), a joint UNMC and University of Nebraska at Omaha committee that reviews research proposals. Dr. Dixon credits his staff and UNMC leaders for helping the medical center make remarkable achievements in comparative medicine. "I have the best staff in the world," Dr. Dixon said. "We're here to make sure our residents get the appropriate care. The field governing the use of animals in research is heavily regulated and monitored. UNMC is registered as a research facility with the U.S. Department of Agriculture (USDA) under the Animal Welfare Act. The care and use of animals used for research at UNMC is based on national guidelines and federal regulations, including the U.S. Government Principles for the Utilization and Care of Vertebrate Animals Used in Testing, Research and Training; the USDA implementing regulations of the Animal Welfare Act; U.S. Public Health Service Policy Assurance for the Humane Care and Use of Laboratory Animals negotiated with the Office of Laboratory Animal Welfare, and the Guide for the Care and Use of Laboratory Animals. UNMC's Institutional Animal Care and Use Committee (IACUC) is governed by the Animal Welfare Act and other federal regulations. UNMC has participated in the voluntary peer review accreditation process since 1966 and participates in a program review and site visits every three years. UNMC was the 31st of 700 institutions in the world to be accredited. "I think the most important part to making this all work is the administrative support our team has from Dr. Tom Rosenquist (Ph.D.), the vice chancellor for research, and Chancellor Maurer," Dr. Dixon said. "The infrastructure upgrade they've helped create since 2001 has really been instrumental in allowing us to perform the job the way we should. As a result -- in addition to improving animal health and well-being -- we have been able to streamline our services and thus significantly reduce costs for researchers who use animal models." Dr. Dixon and his team are an invaluable part of the research enterprise at UNMC, Dr. Rosenquist said. "Dr. Dixon does excellent work. He and his staff have had extraordinary success in keeping UNMC research animals healthy and minimizing variables in animal models provided to the UNMC research community," Dr. Rosenquist said. "He has a well-deserved international reputation in the field. An example of this is his long-term membership of the 42-member leadership council of the AALAC International, the gold standard accreditation agency for 700 animal research facilities in 29 countries." Dr. Dixon received his bachelor's and doctor of veterinary medicine degrees from the University of Missouri at Columbia. He received his master's degree in surgery from the Colorado State University in Fort Collins. He completed his residency in laboratory animal medicine at the United States Army Medical Research Institute for Infectious Diseases (USAMRIID) at Fort Detrick, Md., and currently is the only board-certified in veterinarian in the specialty in Nebraska. He served as one of the Animal Biosafety Level Four veterinarians at The United States Army Medical Research Institute for Infectious Diseases (USAMRIID) working in a protective suit with nonhuman primates infected with ebola virus and marburg virus. After retiring as a lieutenant colonel from the U.S. Army Veterinary Corps, he served three years as director of the Center for Laboratory Animal Care at the University of Connecticut Health Center in Farmington. What others are saying about Steve Dixon, Ph.D.
"He has been instrumental in making significant changes in both our animal care and use program, as well as our absolutely outstanding animal facilities. Indeed, I have been informed by the experts who've toured the animal facilities at the Durham Research Center that our facilities compare very favorably with those at very prominent pharmaceutical companies. It has been my pleasure to work closely with him over many years and I look forward to continuing to interact with him for many more." "Dr. Dixon is wonderful. I like him a lot. In the Army, I knew him as thoughtful, interactive, supportive and smart, and he was very well respected. When I found out he was at UNMC, I was very excited. He's always been there for us and has been outstanding with a capital 'O.' I can't say enough about him." "Dr. Dixon, while fulfilling the role as director, is a terrific boss. He is more accurately defined as a terrific teacher and mentor to the employees of comparative medicine. He continually disseminates information, knowledge and experiences he has accumulated in his 35 plus year career, enabling staff to become more effective employees. As evidence, more than 80 percent of the husbandry staff have obtained certification by the American Association for Laboratory Animal Science. In addition, we have three of about 150 people nationally who have earned the qualification of certified manager of animal resources." "I can't tell you how many times I've gone to him for clarification about a procedure or policy and, within minutes, we're talking on speaker phone with someone half-way across the country who happens to be the leading authority on the subject. It usually turns out that the two of them are on a first name basis and have known each other for years. He also seems to know just about everyone here at UNMC who's ever cleaned his office, delivered his mail or cooked his omelets. He just has a gift for making you feel like you're a member of the family. He really is a great guy to work for." "He is devoted to his profession and serves as a great role-model for the other employees in his department. UNMC is privileged to have Dr. Steve Dixon leading the comparative medicine department, as he is truly dedicated to assuring animal research is done within all the regulations and guidelines and most importantly ensuring the welfare and care of the animals."